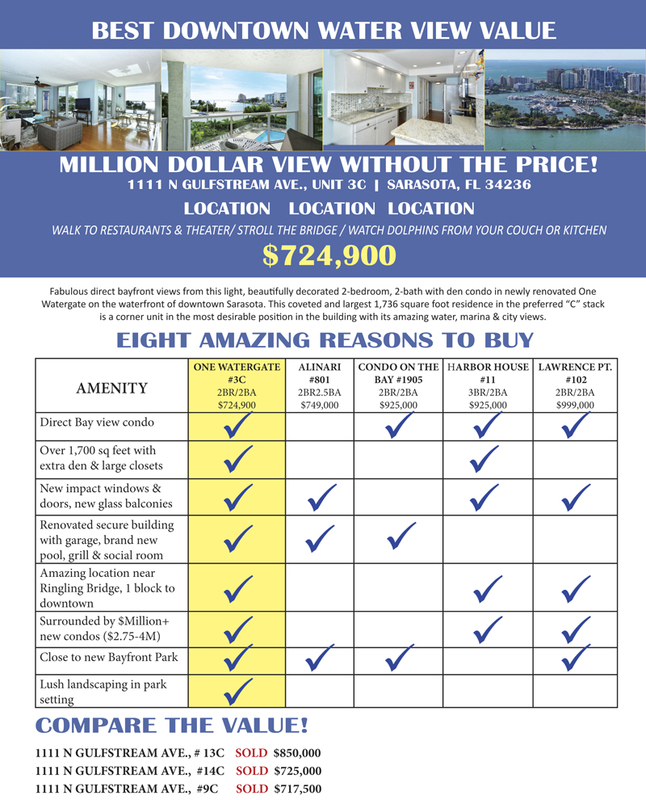 Eight amazing reasons to buy 1111 N. Gulfstream Avenue, #3C at One Watergate in downtown Sarasota, Florida. 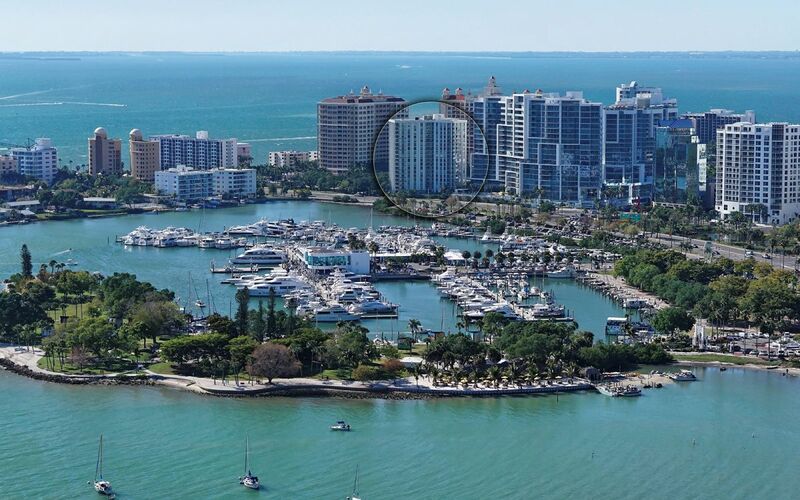 This 2-bedroom, 2-bath condo with den has a fabulous direct water view where you can watch the boats in the marina and the dolphins jumping right in front of you. The largest floorplan at 1,736 square feet is a corner unit with impact windows, doors, and large glass balcony allowing natural light into this residence. Beautifully decorated with wood floors it is a buy at $724,900. One Watergate is a rare find downtown as a secure building in a lush park setting and surrounded by multi-million dollar condominium buildings. Mere steps to the Ritz Hotel for a cup of coffee and the rooftop terrace bar at the Westin Hotel. Completely renovated with new heated saltwater pool, garage parking, grill area. social lounge, two resurfaced tennis courts & popular pickle ball. 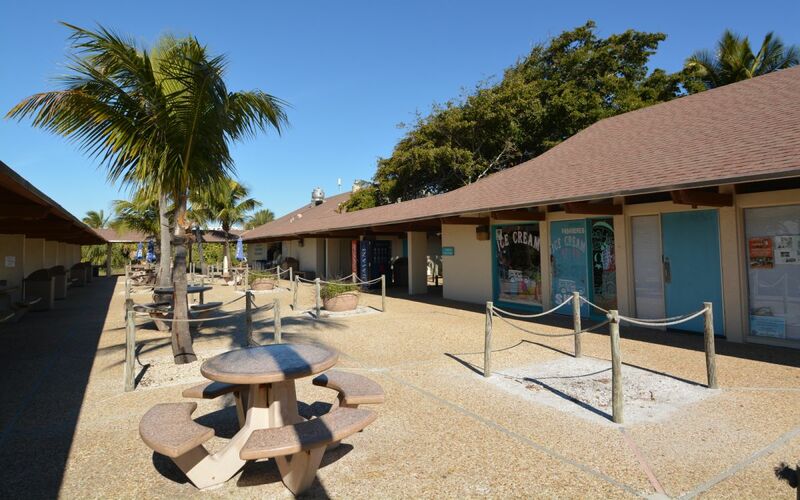 Minutes walk to theater, dining & shopping in Sarasota's downtown cultural center or stroll the Ringling bridge to St. Armand's Circle & Lido beach. 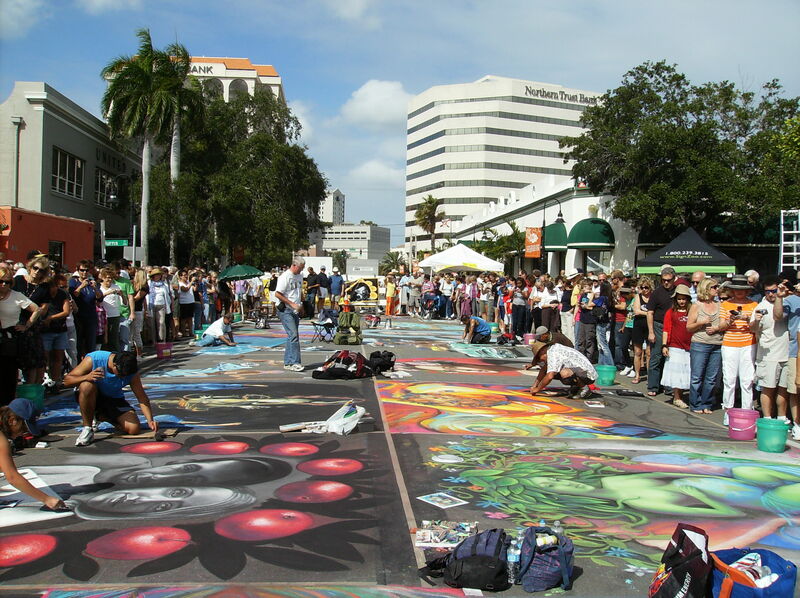 The popular Chalk Festival is returning the first weekend of April 2019 to downtown Sarasota, Florida. It has been held in the charming town of Venice for the past several years. Sarasota is known for its arts and cultural offerings and is known as the center of the arts and theater in Florida. Artists from around the world will create their 3-dimensional works of art on the city streets of Burns Court. It is actually an amazing sight to behold! 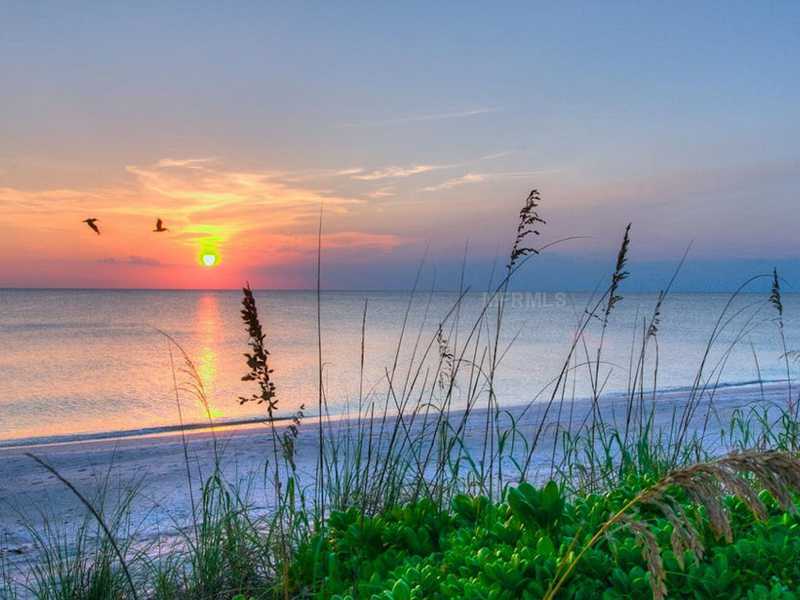 Casey Key, an eight-mile long secluded island between Siesta Key (Sarasota) and Venice, Florida, has a history of Indians, U.S.military and more recently reclusive celebrities. Many are not sure where the name Casey came from, but it is surmised the island was named after an Army Captain John Casey who charted the island and put it on the map in the mid 1800s. Prior to this time, the island was known as Clam Island, probably due to the shellfish which the Seminole Indians lived on. Captain Casey charted the island and, it is said, had a trusting and impactful relationship with the Seminoles. The island now is a very desirable location for those searching for a peaceful, secluded existence with lush, expensive real estate bordering on the long pristine beaches and bayfront waters. You will find luxurious new homes and retreats scattered with old Florida cottages, and barely a soul on the white-sand beach. The cultural activities of busy downtown Sarasota can be reached in just over half an hour, and Venice downtown's quaint shops and restaurants are a mere few minutes away. 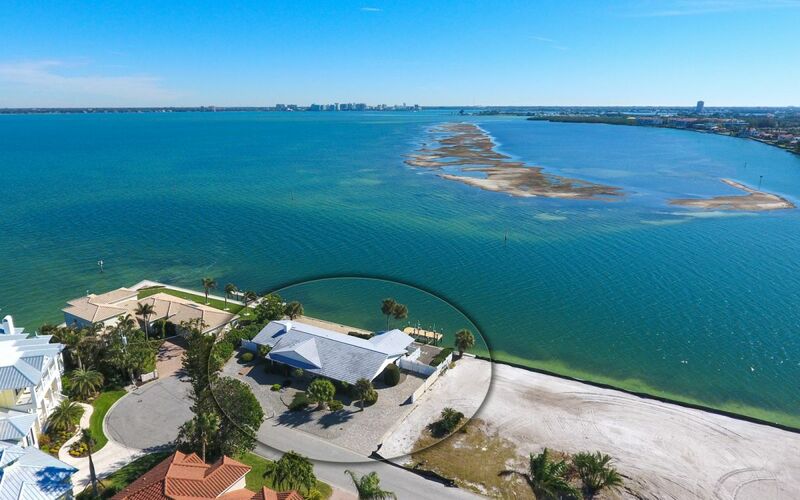 I currently have an amazing bayfront home & guest house for sale on Casey Key at 719 Casey Key Road with stunning water views and private deeded beach access. This property is on almost half an acre with a new boat dock. 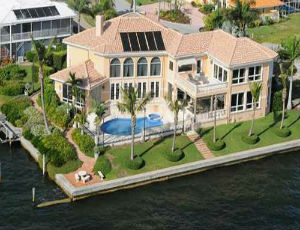 CLICK HERE for more information and HERE for additional homes for sale on Casey Key. CLICK HERE for information about this great offering! Controversy over a local developer's plans to build an upscale bar and restaurant in the place of the Lido Beach Pool & Pavilion in Sarasota has been mounting. Over 5,000 petition signatures were obtained in opposition. A meeting on Monday supported by an onslaught of community residents showed the opposition, citing that the plan would inhibit local Sarasota residents and families from being able to park and access a public beach area, which has been available for residents for decades. The developers have withdrawn their plans, and the Sarasota commission voted 4-1 against the plan. The Van Wezel Performing Arts Hall, perched on Sarasota Bay, was designed by Frank Lloyd Wright and has been there longer than I have been in Sarasota, Florida - over 45 years. This amazing venue brings top performances from orchestras, dance, singers, broadway plays, and lecture series. Some of the events in the 2019 season are the Broadway play, The Lion King - singer Gladys Knight - The Israel Philharmonic Orchestra - The Boston Pops - Dancing with the Stars - The Russian National Ballet. Venice, Florida, fifteen miles south of Sarasota, has a beach which allows dogs to play together and swim in the Gulf of Mexico. It is an amazing location in Sarasota County where dogs all seem to get along together. 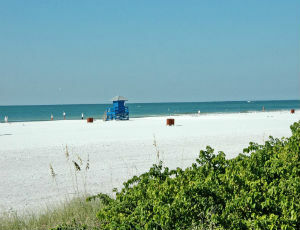 Just south of this beach is Caspersen Beach, where you can look for sharks teeth. 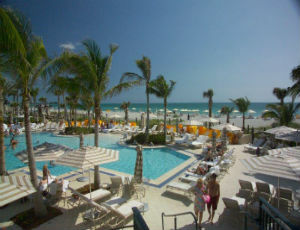 This short video shows you that this is just one more thing to do in Sarasota, Florida! 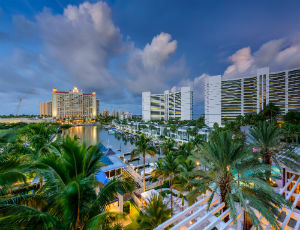 Florida continues to be the top choice for foreign buyers of investment and vacation homes in the U.S. 19 percent of foreign buyers purchased property here in 2018. Not surprisingly, Sarasota has been ranked high again at #3 as the best place to retire in the United States, according to a report by U.S. News & World Report. I can attest to that, after having lived here in Sarasota for 44 years since I moved here with my family as a teenager from England! 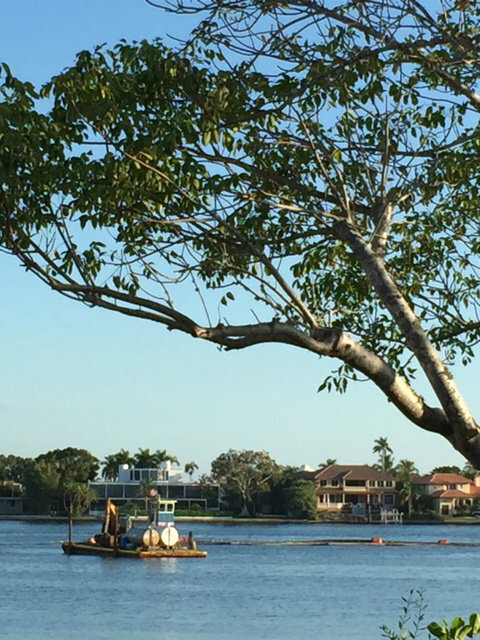 Work has started on the dredging of New Pass between Lido Key and Longboat Key. As you drive over the New Pass bridge, you see the dredging equipment in the pass below you. The loss of sand on south Lido Key is serious and it is necessary to renourish the beach immediately. 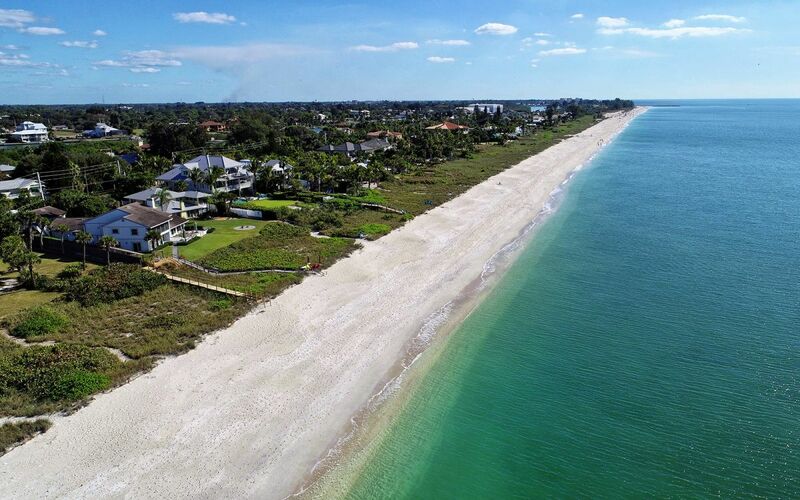 Previously the residents of Lido Key had asked neighboring Siesta Key to "give back" some of the sand that had shifted, but Siesta Key is reluctant to do so, so the sand is not coming from Big Pass. Occasional renourishment of all the beaches is common in waterfront areas. Despite rising interest rates, sales and prices of real estate have continued to rise in the Sarasota/Manatee area. That is not surprising considering 70 percent of my buyers pay cash, so interest rates are not usually a factor. In addition, many buyers are coming from the north to get away from the cold, high property taxes and state income taxes. Now that Sarasota is "on the map" and a destination, the area is expecting 26,000 new families to move here in 2019. 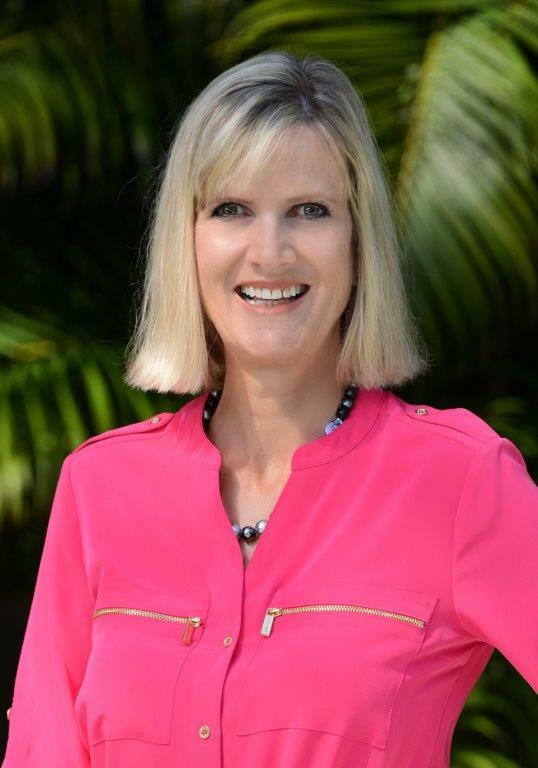 Sarasota real estate sales rose 7.6 percent in the past year, and inventory continues to be low with only a 2.7 percent increase over last year. It is still a seller's market. 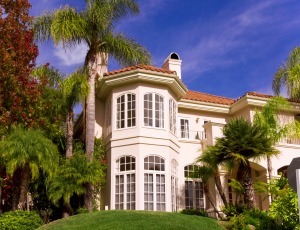 Properties that are remodeled and in good condition are the first to sell if priced properly.